According to the Neoplatonist Porphyry, the followers of Mithras regarded the midsummer solstice as the point where souls descended in genesis from the heavens into this world, while at the midwinter solstice they re-entered the heavens in apogenesis. The Sun-god Mithras oversaw this migration of souls from his seat at the equinoxes, midway between the solstices. Beyond Mithraism Porphyry attributes this notion of psychic entry and exit through the solstitial points to his Platonic predecessors, Numenios and Kronios, and in some respects even back to Plato himself. 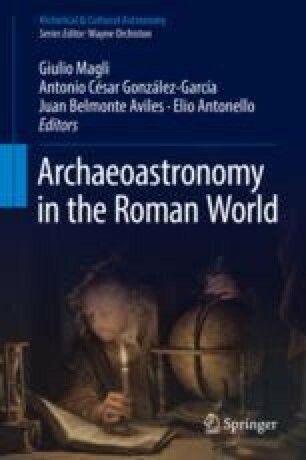 This chapter examines to what extent such a philosophy or theology is discoverable also in Imperial and Late Antique Roman buildings, notably in the domed spaces of Nero’s Domus Aurea, Domitian’s Palace, the Pantheon and (their architectural descendants) the churches of Byzantium. It is found that there are grounds for seeing the pagan Imperial buildings as designed around lighting effects at the times of the equinoxes and solstices, perhaps to enable imperial hierophanies. Perhaps reflecting this aspect of Roman domed structures, a divine hierophany is undoubtedly intended to be highlighted in the later Byzantine churches, which were designed to allow a shaft of light to fall on the altar through the apse windows at those moments in the liturgy when the Holy Spirit, represented by the beam of light, was imagined as descending to sanctify the offerings presented to God by the priest in front of the altar. These architecturally orchestrated effects could be particularly significant around the times of the winter solstice and the vernal equinox, which were associated liturgically with Christmas and Easter respectively. I would like to thank Professor Giulio Magli for the invitation and material support that enabled me to participate in this conference. This research was also supported by a Marsden Fund grant from the Royal Society of New Zealand (10-UOO-064).